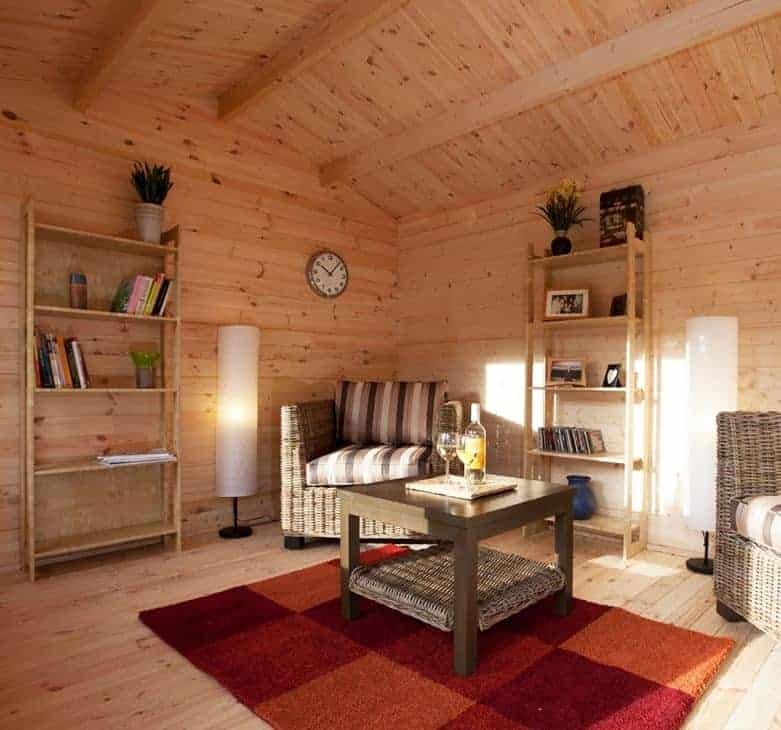 We can see lots of uses that this well designed and spacious log cabin cabin could be put to. With the installation of computing equipment inside, for example, it could make an ideal office space away from the distractions of the house, and with increasing numbers of people working from home this could prove very popular. There’s a key operated lock on the double doors, so you won’t have to worry about the security of whatever’s kept inside. The double doors are not only large, they’re also fully glazed. With the inclusion of two windows as well the interior is filled with natural light on a sunny day. We were pleased to see that the windows are fully opening, so they allow lots of fresh air in for ventilation purposes. This means that this log cabin is a very pleasant environment to spend time in whether you’re using it for work or leisure. 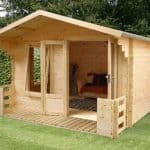 The logs used for the walls lock together in a tongue and groove style, and indeed tongue and groove timber is used for the joist elevated floor and the apex roof. With thicker logs than we often see on similar buildings, this is very good at keeping water out. 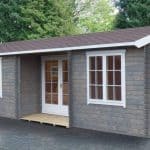 Whilst this sits firmly in the mid size range of log cabins we review, its pure rectangular design without any diagonals or cut aways means that it allows the owner to make the most of its dimensions. 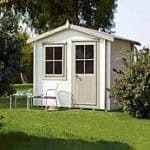 For this reason, you’ll be surprise just how much you can fit inside, and it can easily take a selection of chairs and a desk or even a bed meaning that it’s as suitable for use as a spare bedroom as it is as a home office. The apex roof certainly caught our eye, being covered as it is with attractive green felt. Underneath this is a tough tongue and groove structure and so it should prove very effective at channeling water away. It gives a ridge height of 2.54m and a taller than average eaves height of 2.14m. The overall width of the cabin, on the side where the door is positioned, is 4.00m and the overall depth is 3.00m. 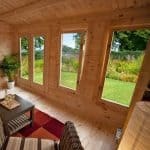 We were very impressed with the cladding used on this cabin, as the logs are smooth planed and made from kiln dried Nordic spruce timber. Both of these factors add extra durability and weather protection, as does the log thickness of 34mm. This is thicker than the logs we see on most of the cabins we review, and means that once assembled the building feels reassuringly strong and stable. The floor also impressed us, as the tongue and groove timber used here, just like on the roof, is 19mm thick. This is only slightly above the average, but still means that we’d have no worries about putting heavy furniture onto it. Further reassurance is provided by the inclusion of pressure treated floor joists. It’s essential that wooden floors are raised above ground level, where high moisture content brings with the threat of rot, and the floor joists on this cabin perform that function very well. We feel that having well treated timbers is essential, not optional, in a climate as damp and unpredictable as ours. We were very disappointed, therefore, to find that no preservative treatment has been used by the manufacturer other than on the aforementioned floor joists. That makes it vital that the customer adds their own preservative coatings immediately after the building is assembled, and just as vital that this protection is topped up every year. This can take a significant investment in both time and money, and even if this is kept up there is no extended warranty against rot provided by the manufacturer. At this price, we feel an anti-rot guarantee should have been included. The double doors stood out for us both for their size and their attractive design. 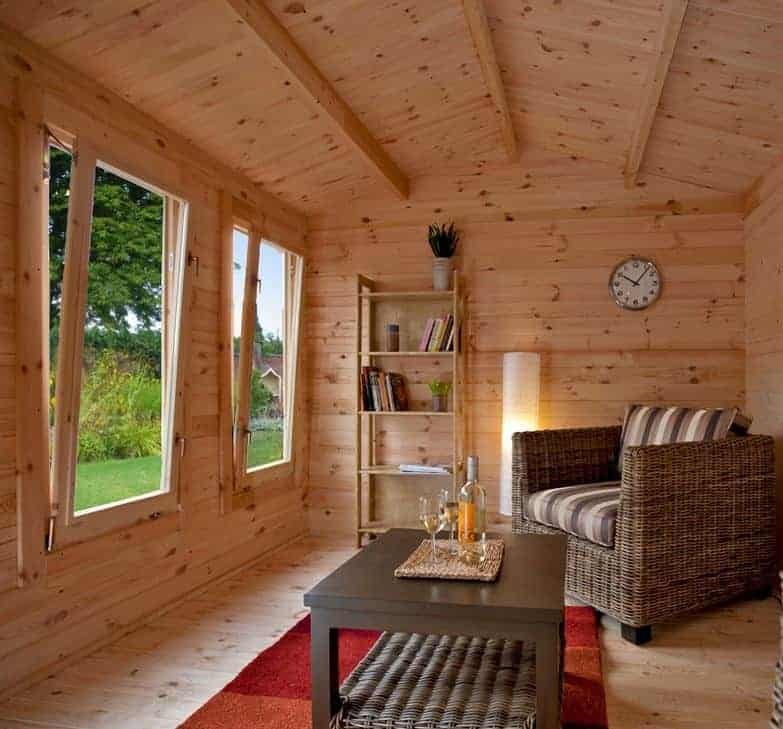 The wide opening makes it easy to get even large and bulky furniture inside, which is always a consideration in a log cabin of this size. Both doors also feature a full sized glazed panel in the centre. Adjacent to these are two large double glazed windows, so when the sun hits the front the interior is filled with light. What we liked most about these windows, as well as their sound blocking and heat retaining properties, is that they can be opened via a tilt and turn mechanism, making it easy to ventilate or cool the building on warm days. Being double glazed, the windows are far more resistant to impact than standard glass, which we feel is a useful security feature in itself. Even more useful is the inclusion of a key operated locking system as standard on the double doors. 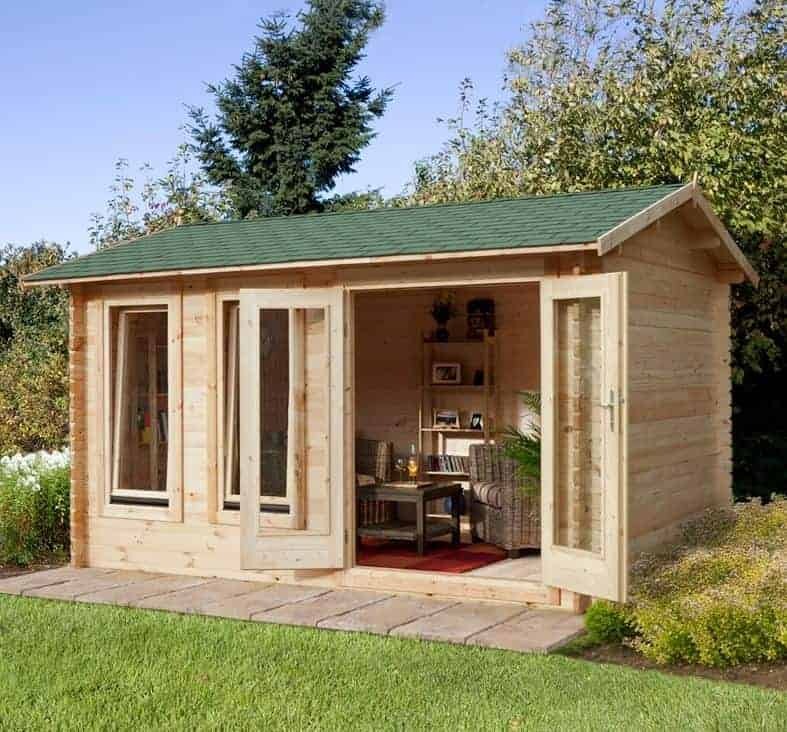 In these days of increased concern regarding break ins of garden buildings, we feel that this not only gives added value it gives real peace of mind as well. 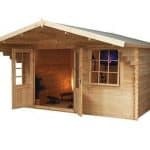 As mentioned earlier, we feel it’s essential to purchase a high quality wood preserver along with this log cabin, although it will need to be bought from a separate source. One option that can be purchased along with the cabin is a professional installation service. 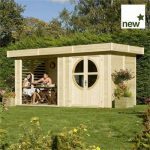 We feel that this is rather extravagantly priced at £599, but we know that many people may be put off by the thought of carrying out self assembly on a building of this size, so it could prove highly useful. As the use of wind resisting chalet connectors on the corners shows, there has been great attention to detail and quality. The planed and thick logs are in themselves very durable, and yet we feel this is let down by the lack of any preservative treatment being used prior to shipping. This feels more spacious than it looks from the outside, so there’s lots of room to install furniture, carpets or electrical equipment. Whilst the instructions are clear, the size and weight mean that even with a friend’s help you should allow a full day for installation. Alternatively, of course, you could use the optional assembly service. 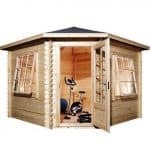 Other than the need to purchase, and then apply, wood preserver which brings with it an additional expense, we feel that this provides good value for money. Final Thoughts: This looks less like a log cabin and more like a miniature home, which is a reflection of just how versatile it is. With wide double doors as well, it’s easy to bring in the furniture and equipment that can transform the building into whatever you want it to be. The timber will need treating of course, but by using a coloured wood preserver you can customise it to fit in perfectly with its surroundings. With the right care and regular treatments applied, we feel this should prove to very durable and could then add to the value of your property as a whole.